Passed peacefully away at Kenny’s Pond Retirement Community in St. John’s, NL on April 17, 2017. Predeceased by her parents Macario and Miguela Cruz; brothers Faustino and Mario; sisters Purification and Edelicia. Left with fond and loving memories dearest husband of 60 years Juanito; son Michael (Anne Macdonald, Lesley, Jennifer, Kathryn), daughter Dorothy “Donna” (Ken Milks, Gabby, Connor, Carrie), son John (Elizabeth Bautista, Emily, Megan, Chloe); brother Arturo (Mely), sister Nolita (Oscar), brother Ernesto (Lita), sisters Corazon and Wilhemina; numerous nieces and nephews, relatives and friends. 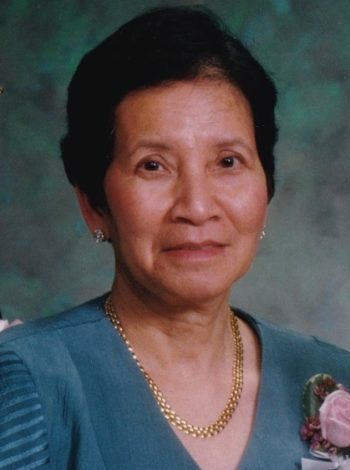 Aida started piano at the Conservatory of Music at the University of Santo Tomas in Manila, Philippines in 1950, but went on to complete a Bachelor’s degree in Pharmacy in 1955. Juanito and Aida married in 1957, and then travelled to Milwaukee, Wisconsin in a student exchange program that same year. Juanito took up a residency at St. Michael’s Hospital and Aida trained as a medical technologist at St. Joseph’s Hospital. She was a member of the American Society of Clinical Pathologists. The family first moved to Newfoundland from 1962 to 1965, and permanently settled there in 1968. Aida was a very supportive and loving stay-at-home mother and doting grandmother, who was well known for her cooking and baking, especially ethnic Filipino food. She loved cooking for Filipino community parties, and baking for St. Pius X Parish bake sales. She was also skilled in sewing, knitting and crochet, making everything from sweaters and mittens to dresses and Halloween costumes for her children, nephews and nieces, and grandchildren. Her love of music and playing piano was passed on to her children and grandchildren. She loved to travel around North America, visiting her siblings in California, Ontario and Vancouver. The family wishes to thank all the staff at Kenny’s Pond, particularly the LPNs, RNs, personal care attendants, and dining room and housekeeping staff on the second floor. A special thank you to Dr. Stephen Lee for his caring attention and help. Visitation at Carnell’s Funeral Home, 329 Freshwater Road, St. John’s, NL on Saturday, April 22 from 7-9 pm, Sunday, April 23 from 2-4 pm and 7-9 pm. Mass of Christian Burial at 9:30 am Monday April 24, 2017 at St. Pius X Church, 16 Smithville Crescent, St. John’s, NL. Internment at Holy Sepulchre Cemetery. Donations in Aida’s memory can be made to St. Pius X Parish in St. John’s, NL. Please accept our condolences on your mom’s death. Donna….my sincerest condolences to you and your family. Our Ate, Aida, I’am thankful that I had an oppurtunity to be around and look after you for such a period of time, You had a very gentle spirit and full of sense of humour had a great time with you with laughters coz of your jokes and memories you had in your life..That will kept in my heart… Goddbye Ate Aida, no more sorrows and pain and sufferings with you .. May you gentle be in spirit of our Lord.. Our Sympathy to Bautista Family.. I will never miss you because you will live in my heart forever. Gentle sweet soul, kind and with humour, and the light in your spirit overflows from your gaze. The music was so important for you, and between us. We listened to and danced tango, and especially one song in Spanish – “Besame Mucho” – we sang together all the time. You will be forever in my memory and my prayers. Michael, so sorry to learn of the passing your dear mother. Having lost my own mother I understand the loss and pain you are experincing. May God hold her in His eternal peace. May your grief be eased by the many wonderful memories you all share. Our most sincere sympathies on Ida’s passing. Many great memories, we have had of her with your family. Hope that you are comforted by the love that friends and family offer at this time. Mike, Anne and family: I am so sorry to hear of your loss. Sincerest condolences at this sad time. May the love of family and friends and your cherished memories bring you comfort during this difficult time. Our deepest sympathies to your entire family on the passing of your dear wife, mother and grandmother. I saw her many times while visiting with my own mother on the second floor at Kenny’s Pond..
May cherished memories of happier times bring you comfort at the this time. Dr. Bautista and family, so very sorry for the loss of your mom. Thinking of you. God Bless. Sincerest condolences on your mother’s passing. Our most sincere condolences on the passing of your Mother. She certainly was an inspiration to you all. We will keep her and you in our prayers. To the family of Mrs. Bautista , you are in our thoughts and prayers. Dr. Baustista, we are so sorry for your loss. WE were very sorry to learn of the passing of Mrs.
Bautista.We knew her from her faithful service at St.Pius X Parish where she was such a loyal and faithful parishioner. We express our deep sympathy to all her family and will remember her in our prayers. Life is the greatest gift that has given us. Certainly, heaven is rejoicing for another soul has finally reached her TRUE HOME. Our Deepest Condolences to Mang Johnny & the whole Bautista Family. To all the Bautista family, I am saddened to learn of the passing of Mrs. Bautista. My sympathies and prayers for you all. May she rest in peace. My Deepest condolences and prayers are sent to all of the Family on the loss of a Beautiful woman ! !